Gain beautiful spaces without the time maintaining them. Create outdoor spaces where you can spend more time with family and maximize the use of it for several seasons. Entertaining outdoors has become the leading trend. With PAVERDECK™ you gain a beautiful space without the maintenance, allowing you more time for other things with family and not working. Until now, using pavers for a decking surface was expensive and complicated, and traditional wood and composite decking left people disappointed. Now you can choose PAVERDECK™ for a new deck with a complete steel structure on new footings – at an affordable cost and simple installation. Our system is the strongest deck structure available, and comes with the only 30-year structural warranty, and certified by Underwriters Laboratories for commercial and residential applications. 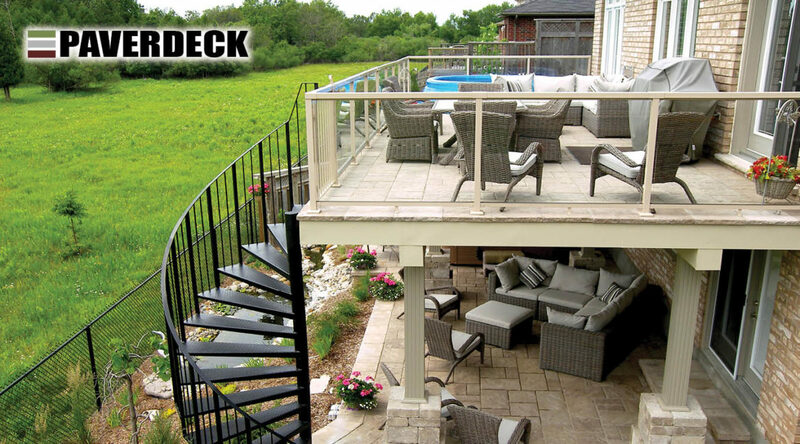 Install PAVERDECK™ at any level as a patio or elevated at any height. Concrete or stone pavers have the durability to withstand the weather and the sun – no distortion, warping, fading. You can easily change a paver should one crack or stain. Pavers are readily available at less cost than composite decking, and come in a range of colors and patterns. One of the most appealing features of concrete pavers is their design flexibility. The system is easy to install with no special tools required. Learn more. Why choose the SPX PANEL structure? The construction industry has seen little fundamental change in the way we build structures. Although we’ve seen allot of technology advancements in cars, planes, and communications! While there have been advances in materials and finishes, the difference today is that people want beautiful spaces, but they don’t want to spend the time maintaining them. Until PAVERDECK™ there was really no other option. PD is made from high strength galvanised steel, easy to assemble, and virtually impossible to fail. PAVERDECK™ is available across North America at an affordable price that competes with traditional methods. Surface finish methods and materials are driven by your own tastes and budget. How are the pavers applied to the deck? Glue the perimeter pavers to the steel deck-pan using beads of polyurethane adhesive. We recommend an exterior grade adhesive that cures flexible – such as PL Premium or Miracle Lumber Lock. Field pavers are dry-laid over a landscaping fabric. This allows for simple removal in the event a paver is damaged or stained. Fill the joints with a standard polymeric sand specially formulated for pavers. We provide stiffeners for railing posts, pergola columns, or other structures. CONTACT US for technical assistance. PAVERDECK™ is a lifetime solution? PAVERDECK™ resists warping, rotting, splitting, insects, fire, fading, or otherwise. Stone or concrete pavers can last indefinitely, depending on the quality of the paver. If you’re installing a PAVERDECK™ around a pool, then first apply a waterproof membrane such as EPDM roofing, or peel/stick moisture barrier to prevent the pool water reacting with the deck. 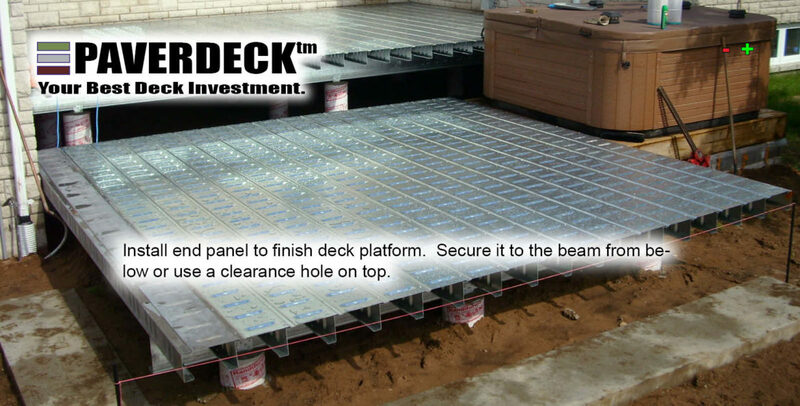 PAVERDECK™ competes in cost with low maintenance decking. PAVERDECK™ is priced to compete (within 10-15%) with composite decking on an installed basis using a standard paver. The main difference is that PAVERDECK™ provides a beautiful space without the maintenance. Paverdeck is available through our dedicated Dealers , at MENARDS, and THE HOME DEPOT. We are available at 1-800-725-5228, or mail@paverdeck.com.